Congrats to everyone that has finished up the Open! Well done to all of you. This week we are going to be heading back to the drawing board and taking an assessment as a community. It will also act as a deload week with some lower volume. This will do a few things for us. Working to find our 1 RM Back squat today so make sure to get good and warm with the hips and low back. 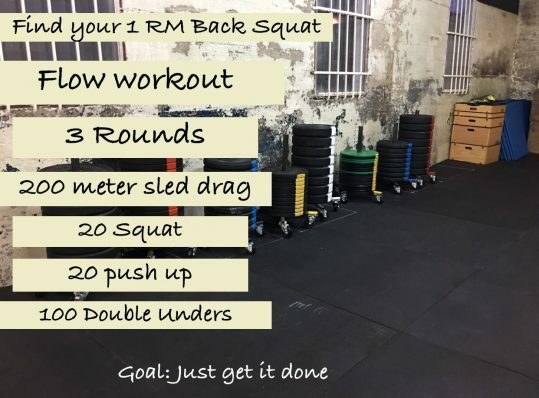 Take the time to get in some good build up sets with lighter loads and pay attention to how you want to make jumps as you are increasing weight on the bar to make the most of that 1 RM attempt. Toss on a weight vest for this one if you like. It’s simply about moving and not as much about intensity. If you don’t have a sled you can sub out a banded glute march for roughly 2 min or do a 400 meter run with a medball or plate if you like. Keep the gymnastics movement legit with quality reps and if you need to ditch the vest to work on DU technique feel free.